Digital Radio services in Northern Lincolnshire and East Yorkshire have benefited from a boost to coverage with 220,000 extra listeners now in the coverage area. To enable the boost in coverage without interfering with other DAB stations, a number of services have now changed frequency in the region. At a special retune event at The Guildhall in Hull, listeners were urged to retune. 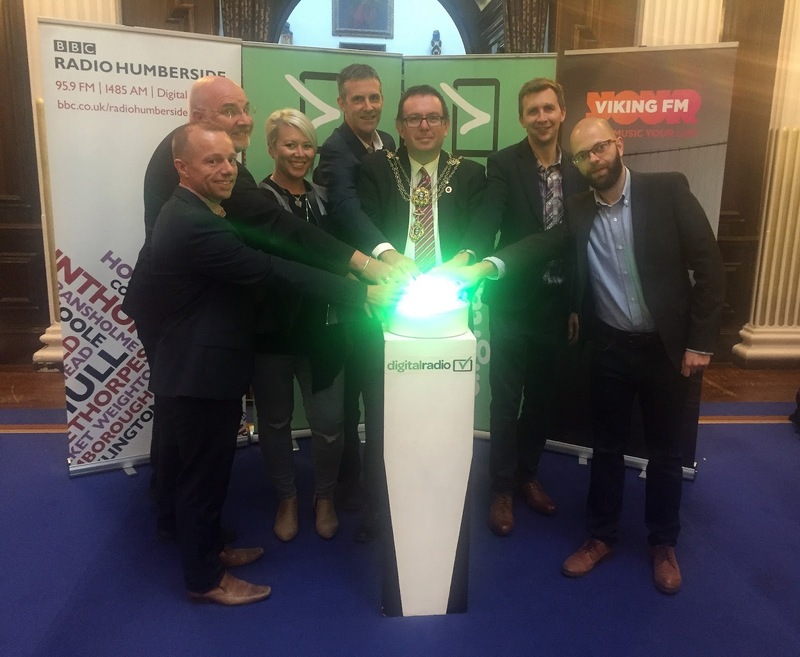 The Right Worshipful the Lord Mayor of Kingston upon Hull and Admiral of the Humber, Councillor Sean Chaytor, pressed the big green retune switch at 8.30am to mark the moment for listeners to retune their DAB digital radios and start the process of turning on the new digital transmitters. The Lord Mayor urged all digital listeners in Northern Lincolnshire and East Yorkshire to retune to ensure that they could continue to listen to all eleven BBC and commercial stations on local DAB - BBC Radio Humberside, Capital Yorkshire, Viking FM, Viking 2 and Viking 3, Smooth, Absolute Classic Rock, Absolute 90s, Gold, Kiss Fresh and ‘pop up’ Magic Soul Summer. The retune is part of a programme of essential work which will immediately switch-on four new digital transmitters at High Hunsley, Hull Clough Road, Patrington and Garrowby Hill, and one further transmitter in Scunthorpe in October, significantly improving and expanding DAB coverage for over 220,000 listeners in Scunthorpe, Goole, Bubwith, Market Weighton and Stamford Bridge. The five new Northern Lincolnshire and East Yorkshire transmitters will expand DAB coverage from 81% to 98% of households in the area. The transmitters, which have been built by communications infrastructure company Arqiva, are part of an industry and Government programme of work that aims to expand the coverage and listening to DAB digital radio. Government, BBC and commercial radio have agreed plans to build a further 182 local DAB transmitters to extend local DAB coverage to more than 91% of the population which will bring eight million listeners across the UK into coverage and will add over 4,160 miles of roads.